Read the title of this post and then look at the picture. I really don’t have to write anymore, do I? My children, Sam, Ben, and Ruth, are three of the greatest teenagers, ever. As far as I know, we aren’t having problems with drugs or alcohol, sexual promiscuity, or failing grades. (We’ve had some scares with regard to that last one but we’re okay, for now.) Having said that, I am suffering from parental fatigue. Take a closer look at the picture. The clothes on the floor are bad enough, but I can understand them being there. What teenager regularly picks up his or her clothes? It’s the toothpaste cap on the floor that bothers me. See it there, between the cabinet and the toilet? Gross! Aside from the issue of sanitation, that cap on the floor reveals a larger story. Whoever dropped it didn’t bother to pick it up. Why would anyone do that? Sure, I’ve dropped the toothpaste cap on the floor, but when I have, I pick it up. If for some reason I don’t pick it up immediately, I most certainly pick it up when I finish brushing my teeth and reach to put away the tube of toothpaste. “Oh!” I think. “The cap is missing. It must have fallen on the floor.” I look around for it. “There it is!” And on it goes. Whichever young person dropped the cap doesn’t think the way I do. It’s like he or she doesn’t understand the concept of gravity. If something falls on the floor, it stays there until someone picks it up. What’s more, two people came behind the perpetrator (more than once, because the toothpaste cap has been on the floor for awhile now) and neither of them thought the missing cap was odd in the least. Worse yet, they may not have noticed it was missing, which means they haven’t been brushing their teeth. Of course, these crimes against familial harmony are not confined to the bathroom. 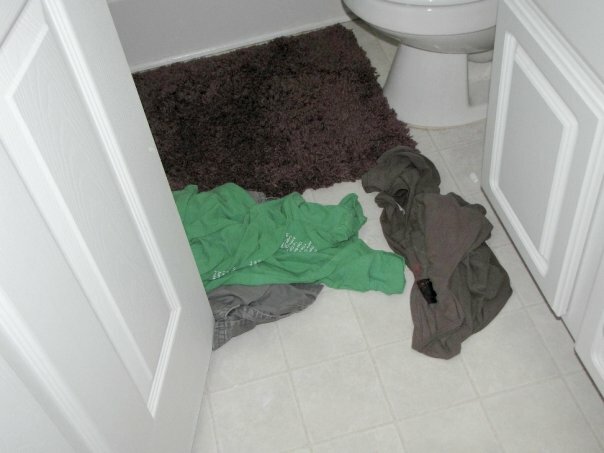 Similar transgressions occur throughout the house in bedrooms, hallways, and the living room. I’m tired of seeing it, and they must be tired of hearing me complain about it. What’s the solution? My dad used to come into my living space and silently point. He would point at the clothes on the floor, the unmade bed, the stack of books, the empty beer cans (kidding! I was just trying to see if you were paying attention), until I straightened everything and put it in its place. Someone once told me that California Governor Arnold Schwarzenegger and his wife Maria Shriver used to pick up anything their kids left lying around and throw it away. Neither of these practices really fits my parenting style. I’m also tired of having to give my teenagers such specific instructions. For example, when emptying the dishwasher, one of them asked, “Where does this go?” It was a fancy glass that goes with a set on one of the shelves in the living room. “On the shelf in the living room,” I answered. A few days later I looked up from something I was doing and saw the glass sitting on a shelf across the room from the others, nestled all alone among some philodendron vines. My children seem to be unaware of their surroundings and incapable of intuitive thinking. I’ve already confessed that I kept a messy room when I was a teenager, and I suppose my kids have also inherited their inability to use reason. My dad used to make me help him on the farm. “The farm” consisted of sixteen acres of land several miles from where we lived where we grew a garden, raised farm animals for fun, and kept a few horses. I was never much help on the farm because I always wanted to be playing at the creek or the pond. One day when my dad and I were putting in the garden, he ran out of fertilizer. He turned to me and said, “Run to the barn and get me a piece of a sack of fertilizer.” I ran to the barn and waited for my eyes to adjust to the dark. There on the floor was half of a bag of fertilizer. Let me be clear: this was really a half bag of 6-12-12. The bag itself was cut in half and it was half full of fertilizer. The torn-off, top part of the bag was lying on the floor next to the bag with the fertilizer in it. After a brief pause, I grabbed the torn-off part of the bag and ran back to the garden. This was the incorrect choice, but how was I to know? My dad had said he wanted a piece of a sack of fertilizer and that’s what I brought him. He got really mad because he thought I was trying to play a joke on him, but I wasn’t. Looking back, I realize that a torn bag has little use in a garden and that I should have know what my dad needed. But at the time I didn’t have a clue and I thought I was doing the right thing. Lastly, I’m tired of my children’s inability to think of others, well, of me, really. Two nights ago we ate Frank’s Famous Frogmore Stew. This is an easy dinner with new potatoes, niblet ears of corn, a head of garlic, Italian sausage, and shrimp dumped into a big pot to boil with Old Bay seasoning. After dinner, we packed the leftovers in separate containers so folks could pick and choose what they wanted, and I packed a lunch plate of everything. I left it in the refrigerator yesterday because I knew I would be eating out for lunch with a friend from work, but I grabbed the lunch plate to take to work with me today. After warming it in the microwave I sat down to eat, removed the cover, and saw that I had heated one niblet ear of corn, one small new potato, and three pieces of sausage. There where no shrimp to be found. Someone had eaten his or her lunch from yesterday out of my lunch plate, even though there was plenty of stew in other containers. ARGH! So here I sit, half starved and upset because somebody ate my lunch! Yes, yes. I know what you’re thinking, “But I thought all you ever wanted was a cold RC in the refrigerator?” Let me explain. My dad comes home from work on a hot afternoon, opens the refrigerator door, and yells something that ends with the statement, “All I ever wanted was a cold RC in the refrigerator!” And thus, for the members of his family, a catch-phrase was born. When we use the phrase, it means, “You are upset over something trivial and you are being silly and irrational. Calm down and get a little perspective.” Of course, we never, ever directed “all I ever wanted was a cold RC in the refrigerator” to my dad, but we have used it every once in awhile with each other. I have often used it as an internal check that reminds me to find humor when I’m feeling frustrated. Obviously, every generation experiences parental fatigue. We made our parents tired and our children make us tired. And so it goes. Thanks be to God. Ah…2 more months…if I can only hold on! But then, I must admit, I will miss my sweet daughter. A moving reply, Anne T.! “Now I just say, ‘Bathroom’ or ‘Cat box’ or ‘dishes. '” You made me laugh, and then you made me cry. You hang in there, too! When I finished reading this piece, I realized I had a choice to make: I could choose either to smile or to get angry about old family wounds. I chose to smile. Grace wins again. So, it sounds like you’re making a call for patience, LeeGayle. It seems like I can be patient a lot better after I have time to think about it. It’s being patient in the moment that I find difficult. Thanks for reminding me that there’s a light at the end of the tunnel. OK! Here’s the deal! I grew up in the forties with a stay-at-home June Cleaver. My side of the bedroom that I shared with Sister Sue was always the messiest, and my drawers of the chest of drawers where we kept our drawers often would not even shut. The hallway to the closet (we called it the hall closet) had a path wide enough for a one foot in front of the other type movement to even get to the clothes. The bathroom we all shared had a tub, sink, toilet, a stool Daddy sat on while he put on his socks and shoes, and a closet. Sensibilities will not allow me to describe the inside of that closet. So what’s the point here? Hummm. Seems to me there are two. Both my sisters were so much better at the neat thing than I was and they still are. Sue, the middle one, always responded immediately when Mama gave the straighten up command while I continued to read; and Kay, the youngest, seemed always absent. And then there’s Mama. Dear Reader, please analyaze your parents with grace! I really believe Mama’s internal throw up your hands and admit defeat relex just took over. The rest of the house was lovely, dusted, pieces in their places because she could control that with little or no turmoil, but the parts I was responsible for existed for some future effort. Look at your children, dear Reader, with grace. I never thought of grandmommy as June Cleaver. I thought of her as more like Maude. It sounds weird for me, a 44 year old, to call my grandmother “grandmommy.” But that was her name.